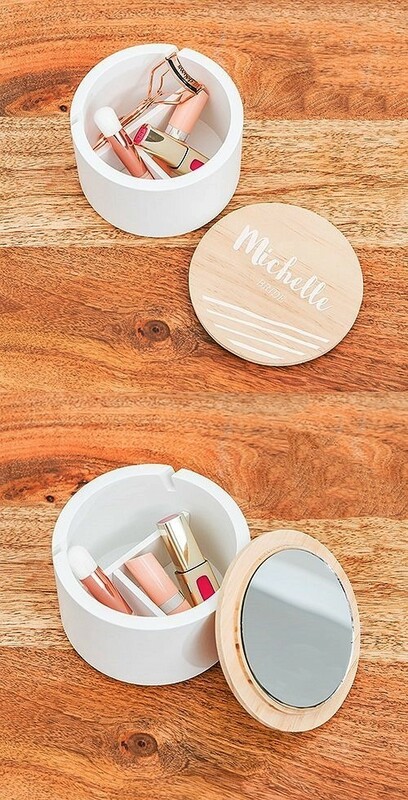 This sleek round organizer with natural wood lid will bring a modern vibe to your vanity or dressing table. With its interior compartments and handy mirror mounted on the underside of the lid, this two tone beauty is ideal for jewelry, cosmetics or any little trinket. Make it extra special with the addition of a personalized design to create a standout gift where style meets functionality. PLEASE NOTE: Pictured contents are not included. "I had so hoped that you'd be able to fill my large order. Thanks very much. Can't wait to receive them." Nancy P.